Home » Articles » Three Piece Suits – Top 3 Advantages! If you follow our blog or our social media channels, you will notice that we often speak about Men’s 3-Piece Suits. The reason behind this is quite simple – if you’re a “dapper gent” or striving to be one, this is undoubtedly a classic and timeless suit you need in your closet (If not a few). This article focuses on the top three advantages to wearing a well tailored three piece suit. If you have ever worn a three piece suit you can certainly attest to this, but even if you haven’t yet you will see just how logical this fact is. The feel of three piece suits compared to that of a two piece simply differs due to, “ta-da”, the third piece. The waistcoat aka known as the vest is an extremely integral part of the success for all three piece suits. It is absolutely imperative to have your vest well-tailored so that it contours to your body perfectly. The feel you have from this is just being more held in place or more held together. Gents, think of when you hit that baseball diamond or the football field with, or without your jock. That’s the difference in feel. It also has a slimming affect even though its an extra layer, and shows a strong balance of fabric from your shoulders to your shoes. Our custom made three piece suits are available in over 220 different fabric options, so whether you’re looking for some glen check, pencil stripes, herringbone, or solids, we’ve got you covered. Finally it is important to think about how it would actually make YOU feel, personally. When you unbutton your jacket (single breasted) as you take a seat, you’re still buttoned up (your vest/waistcoat) which still gives you that distinguished look, you don’t need to worry about how tightly tucked your shirt is, your vest handles it for you. When you stand and your hands are on your hips or in your pockets and your jacket flaps are back again, you still appear suited up and in charge. These are undoubtedly some of the subtle but impacting style marks you make wearing your three piece suits. You remain put together at all times. 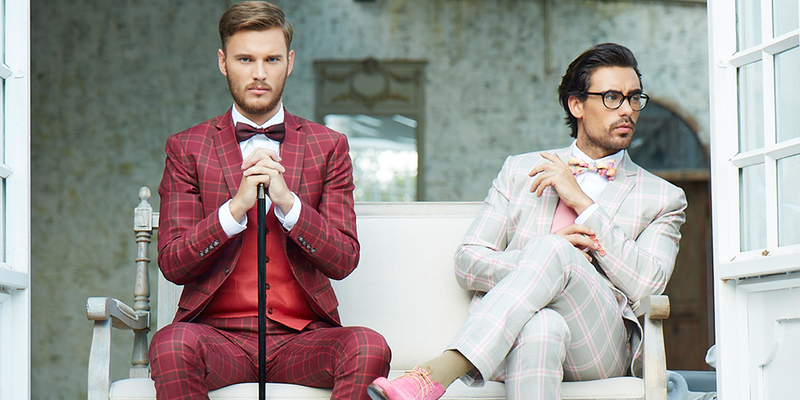 SHOP OUR THREE PIECE SUITS FOR ANY AND ALL HOLIDAY EVENTS NOW! Now when it comes to the fit of a three piece suit the major focus needs to be the waistcoat/vest. It should slide down the sides of your body sleek with no protrusions, lumps, or anything else. Make sure it’s still breathable and comfortable and tailored properly, it shouldn’t act like a corset it should be a well-tailored vest. One very important aspect to the fit that also plays into your overall style with this piece is the collar type you choose for your vest. We currently offer the regular open v-neck, notch, peak, and shawl lapel options for our custom made vests with all our three piece suits. Personally I think different styles work for different reasons, if you’re looking to wear the vest alone at times then I would promote getting one with lapels, but if you plan to use it solely with the suit more of the time than you can certainly go without. Collars and lapels help to define a man’s face, whether they’re on a shirt, suit jacket or a vest and if you wear this vest alone with no jacket lapels then you should have some on your vest to help define your face. Since the fit of most three piece suits are a bit more snug especially around the belt line belts with this suit are not entirely needed and can make you look a bit puffy around your waistline. (The choice is yours) Remember these intricacies regarding the fit of your three piece suits and you will have your suit the suit among suits. When it comes to what statement this suit makes, or even better yet what you can do with it, where you can wear it or even how you can wear it, the options are plentiful. Three piece suits give every man the the following options: You can wear the vest alone with a button down and jeans, you can wear the vest with another two piece suit as long as the colors and fabrics are complementing each other, you can wear the suit as a two piece and leave the vest at home, you can also (my personal favorite) wear it with a pair of jeans and a blazer, you can wear it to the office, events, and formal events. You can also wear this suit with or without a tie, the only thing I would mention is to always keep it buttoned otherwise the slimming and proper gentleman persona it provides will slip away. When it comes to three piece suits, or any suits for that matter there are some very specific style rules each man must know. See our list of the top 15 rules now. Follow these tips and insights and you will also have the top three advantages to your three piece suits nailed. That’s it for this week, if you liked what you read or have any questions please feel free to let us know and comment below! 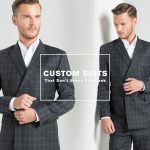 If you’d like to design your own custom three piece suits from nearly 220 fabric options click here and start designing your men’s custom suits today! Don’t forget to subscribe to our newsletter below for free company updates and our weekly sales on men’s custom suits, shirts, luxury designer shoes, and more! Can you tell me what the blue pinstripe suit fabric code is on iTailor? This is fabric no. 51020-3. Great work done on the article. Thanks for sharing the major advantages of a three piece suit. Looked to read your article. Keep writing.